Plovdiv is the centre of the Plovdiv region and is situated in the upper Thracian lowlands of South Bulgaria. It is the second largest city after Sofia with nearly 370,000 inhabitants. Plovdiv already exists since the first millennial before Christ and has been elected to the European cultural capital 2019 because of its cultural diversity and enormous history. The most important Bulgarian fairs take place here as the city offers a very convenient and central location and is therefore known as commercial centre. The Medical University of Plovdiv has its name only since 2002 but can look back on more than 70 years of tradition. 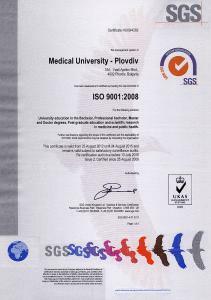 It is certified to ISO 9001:2008 and has developed an important mainstay in the education of foreign medical students in English. The English-speaking courses are especially favoured by medical students from Turkey, Greek, Great Britain, Scandinavia and Germany. The university is, like the Medical University of Varna, divided into four different faculties: the faculty for Medicine, Dental medicine, Pharmaceutics and Public Health. In addition to that nurses and medical experts are educated at the medical college. The Medical University of Plovdiv has modern equipment and one of the most modern European auditoriums as well as the biggest hospital of the Balkan Peninsula. We are already accepting applications for the next term. Since the number of applicants is usually higher than that of the places available you should get in contact with us the sooner the better! Plovdiv is located in the south part of Central Bulgaria. Sofia is situated 130 km westerly, Burgas and the Black Sea 250 km easterly of Plovdiv. The climate is Mediterranean but if you are looking for a winterly diversion you do not need to travel a lot – only 80 km away to the popular winter sports resort Pamporovo. The housing market in Plovdiv offers a big variety – also for small budgets. The Medical University Plovdiv also provides modern hostels where students can rent small but reasonably priced rooms (unfortunately without cooking facilities). Culturally the city offers a lot – and will be able to show that in 2019 as it has been elected to the European cultural capital 2019. A must see are the Open-Air-Events in the Roman amphitheatre. It caters something for all tastes summer long. You want to learn more about studying in Plovdiv? Plovdiv is my favourite city in Bulgaria. It is a melting pot of different ages and cultures, making it outstanding all over Europe. You want to learn more about studying medicine in Plovdiv? 1.1 You want to learn more about studying in Plovdiv? 1.2 You want to learn more about studying medicine in Plovdiv?